^ "The Freeman Spogli Institute for International Studies at Stanford University". Fsi.stanford.edu. Retrieved August 19, 2013. ^ "Francis Fukuyama – International Forum for Democratic Studies Research Council Member". National Endowment for Democracy. Archived from the original on July 8, 2014. Retrieved November 23, 2014. ^ Moss, Stephen (May 23, 2011). "Francis Fukuyama: 'Americans are not very good at nation-building'". the Guardian. Retrieved October 14, 2014. ^ a b Wade, Nicholas (April 2, 2002). "A Dim View of a 'Posthuman Future'". The New York Times. Retrieved March 17, 2011. ^ a b c d e f g Wroe, Nicholas (May 11, 2002). "History's pallbearer". The Guardian. Retrieved March 17, 2011. ^ Fukuyama, Francis (October 7, 1999). "Fukuyama 101". Think Tank (Interview). Interviewed by Ben Wattenberg. Washington, DC: PBS. Retrieved March 17, 2011. ^ a b "Ford-Grilliparzer". Encyclopedia of World Biography. 6 (2nd ed.). Detroit, MI: Gale Research. 1998. ISBN 978-0-7876-2546-7. Retrieved March 17, 2011. ^ Ryan Weddle (February 18, 2009). "Fukuyama: "Social Agenda" Needed to Combat Poverty in Latin America". Devex. Retrieved February 19, 2009. ^ "Letter to President Bush on the War on Terrorism". Project for the New American Century. Archived from the original on December 30, 2004. ^ a b Fukuyama, Francis (February 19, 2006). "After Neoconservatism". The New York Times. Retrieved May 2, 2010. ^ Andrew Billen (July 14, 2004). "Why I won't vote for George Bush". The Times. London. Retrieved May 13, 2007. ^ a b Francis Fukuyama (February 19, 2006). "After Neoconservatism". The New York Times Magazine. Retrieved May 13, 2007. 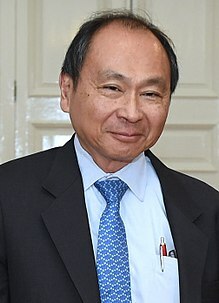 ^ Francis Fukuyama (November 3, 2008). "Francis Fukuyama". The American Conservative. Retrieved October 30, 2008. ^ George Eaton (October 17, 2018). "Francis Fukuyama interview: "Socialism ought to come back"". New Statesman America. Retrieved October 17, 2018. ^ Lewis, Neil A. (February 3, 2006). "Defense Fund Raises Money in Libby Case". The New York Times. Retrieved May 13, 2007. ^ Fukuyama, Francis (June 7, 2009). "Making Things Work". The New York Times. Retrieved May 2, 2010. ^ Beckerman, Gal (September 28, 2018). "Raised in South Central, Joe Ide Expands the Territory of L.A. Noir". The New York Times. Retrieved October 1, 2018. ^ Gottlieb, Anthony (July 4, 1999). "The Postindustrial Revolution". The New York Times on the Web. "Francis Fukuyama On Why Liberal Democracy Is In Trouble (interview conducted by Steve Inskeep)". npr.org. April 4, 2017.